Do busy school days drag you down? Yep. Things promise to be busy this year, maybe even a little crazy. You gotta jump on and hang tight. It’s gonna be a wild ride! ★ What if you could get a plan in action to make mealtimes easier and tastier — all year long? ★ What if you had a few emergency meals right up your sleeve for those cray-cray days? ★ What if you invested time now to map out your family’s favorite meals and have your plan handy to make them when you need them most? ★ What if you had a Kitchen Survival Kit at hand to help you through the crazy of meal planning, grocery shopping, and meal prep? You love your family and you want to provide the best meals you can for them. But, it would be really nice to do it without freaking out, wouldn’t it? Getting your plan together when the time is right for you seems much better than when (and yes, it will happen) you’re pressed to get a meal on the table for your “hangry” family after a very long day. 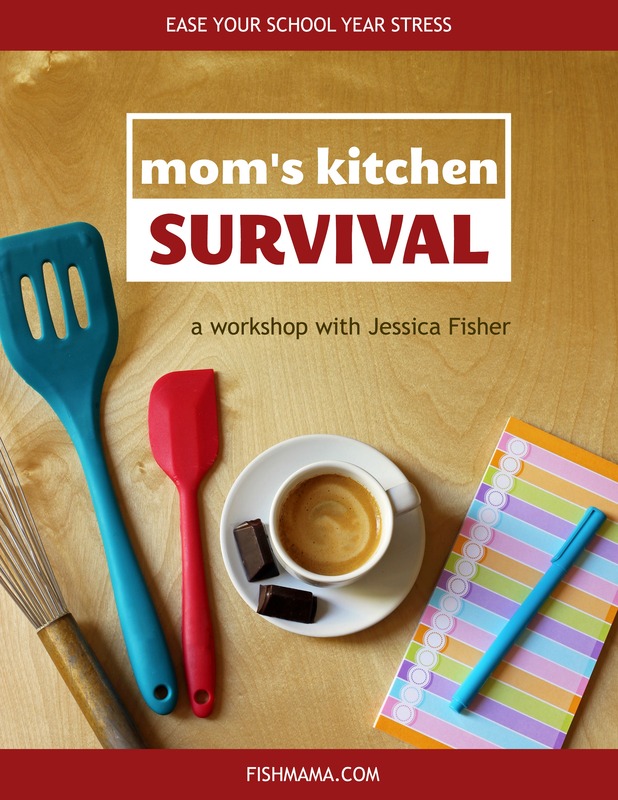 The Mom’s Kitchen Survival Course can set you up for success. Registration is closed. Sign up to be notified when registration reopens in July 2019. Over a period of 4 weeks, we’ll be working through 4 areas of family food that will have a significant impact on your family’s school year. Together with other moms, you’re going to be working out a game plan, customized for YOUR family so that you make it through the long haul — and still have a smile on that pretty face. Mom Food – making sure that YOU get the nourishment you need to parent well and handle all the crazy involved in the day-to-day business of the school year. Quick and Easy Breakfasts – The morning rush can wipe out the best of women. Let’s beat the clock and keep smiling. School Lunches and Snacks – no matter what kind of school your kids attend, it’s important to have a plan for packing lunches and having snacks ready to go. Weeknight Meal Planning – how to get quick and easy meals on the table even when your schedule is packed and there’s “no time” to cook. I learned that I am more capable than I gave myself credit and that when I am intentional about the time spent in the kitchen, it makes my life less hectic and I am able to get dinner on the table. The first week on Mom Food gave me confidence that the course would be manageable and that I would find benefit. I loved the permission to think of myself and not just the kids!